The Class 08, 0-6-0 diesel electric shunter which was based on the prototype LMS designs, became British Railways largest fleet of locomotives. These locomotives were constructed between 1953 and 1962 at Crewe, Darlington, Derby and Doncaster. 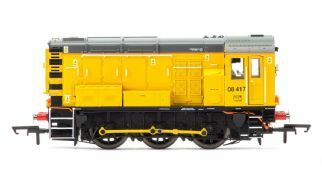 The Class, which includes a number of Class 09 locomotives, has a single cab at the No.1 end and a front section that houses the power unit, generator and control equipment. 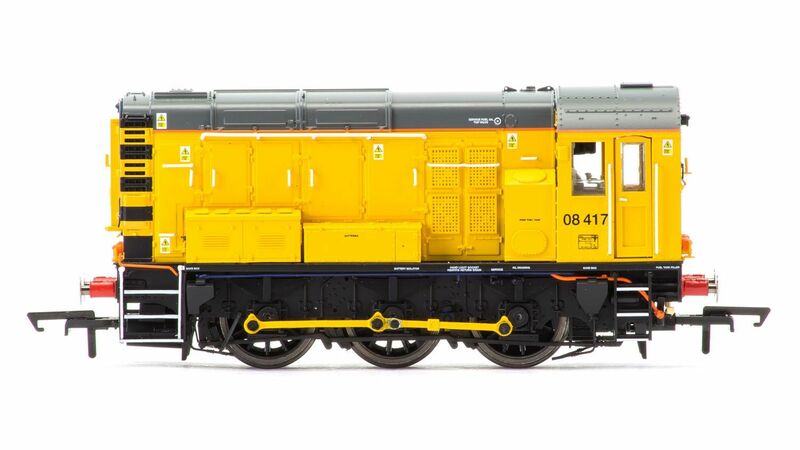 Class 08 shunters are powered by an English Electric 350hp, 6KT engine and have a maximum speed of 15 – 20mph. The Class once numbered in excess of 1,000 with approximately 300 remaining in service today and still represents the mainstay of the UKs shunting power. The standard Class 08 locomotives are in operation in most if not all areas of the UK and are expected to remain in service for many years to come. They are employed mainly as shunting units in marshalling yards and shunting depots but are also used occasionally for short trip workings. Built at the Derby Works and outshopped on the 4 July 1958, Class 08 417 was originally numbered D3532 but was changed to its current number on the 31 December 1973. The locomotive is currently based at the Serco Railtest/AEA Technology Derby RTC. Suitable rolling stock: General freight stock of the period.